There you are glued to your TV set, computer, tablet or smartphone watching the blow by blow coverage of a natural disaster happening in your area. It doesn’t matter if it’s a hurricane, flood, earthquake, solar flares, freak storm or a combination of these events, your world has changed for the worst. However, today's disaster recovery efforts are much faster and better than just ten years ago. Today we receive disaster warning much earlier than before. News coverage is widespread and available on most digital devices; Social Media and the Internet allows us to connect and communicate with friends, family and even work as we move to recover from such devastating events. In this episode of Working the Web to Win, we will explore new technologies, online services and digital capabilities that make terrible disasters a little less terrifying and provide help and hope to the many who have been affected by such horrendous calamities. So, read on and share this with your friends and family as we learn how the internet and digital tech is helping mitigate natural disasters. 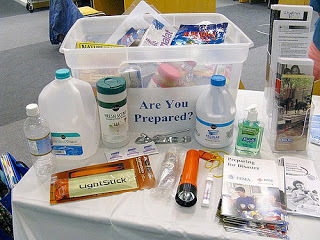 Having a Plan - First, make sure you have a plan and make sure you have created a disaster preparedness kit. The internet is replete with disaster preparedness plans or the taking. I got this list from https://www.ready.gov/build-a-kit. Your Disaster Preparedness Kit Should Include: Water - one gallon of water per person per day for at least three days, for drinking and sanitation. Food - at least a three-day supply of non-perishable food. Battery-powered or hand-cranked radio and a NOAA Weather Radio with tone alert. Flashlight. First aid kit. Extra batteries. Whistle to signal for help. Dust mask, to help filter contaminated air, along with plastic sheeting and duct tape to shelter-in-place. Moist Towelettes, garbage bags and plastic ties for personal sanitation. Wrench or pliers to turn off utilities. Manual can opener for food. Local maps. Cell phone with chargers and a backup battery. The link also has other great suggestions and additional lists as well, so check it out if you don’t already have a disaster preparedness kit. Top items I recommend are smartphones, tablets and laptop computers. hit or dropped, getting too hot, cold, being exposed to solar radiation or too much electrical power. So, your first order of business is making sure you have ways to protect your digital connections to the world by being able to place at least one digital device in a protective container that protects it from all the above issues. A fire proof box will help, but some of them are not waterproof. They also will not shield your devices from a solar flare. Currently, I use a fireproof safe, and I put one of my spare smartphones in a waterproof case and stick the case in an EMP/solar flare-proof bag, then stick the bag in my safe along with important insurance papers. 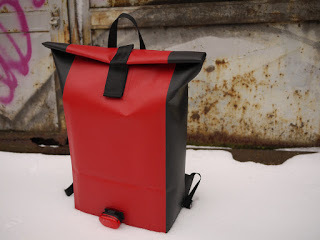 You can find all kinds of water tight boxes and bags for smartphones and tablets and EMP bags can be had on eBay and Amazon for as little as $20. You can also find fireproof bags starting around $20 as well, but they are not as good as a fireproof safe. The safe, on the other hand, will set you back at least $40 with bigger models designed to withstand more heat longer starting at around $80 to $100. You can also invest a more robust digital device like a military grade laptop, tablet or smartphone. Samsung’s latest Galaxy tablet is also a higher grade of civilian tech for a little less money. Keep the Power Running - Next, you must keep these devices running for multiple days. In many natural disasters, the first luxury to go is electricity. All digital devices need electricity. They also need the internet for optimal functioning. To keep your devices powered up, I suggest purchasing battery packs that can provide several charges to multiple types of digital devices and make sure they can be recharged by, other batteries, solar power or an operational electrical outlet. I personally have three of these and could keep my smart phone running for about a month if I don’t leave it on all the time. That does not include recharging any of the battery packs. Remember, you don’t have to leave your smart device on, and when it is put on standby, airplane mode or turned off, the battery will last much longer than in the normal on mode. Another useful device is a small radio that can be powered by a battery, cranking it, a solar panel or wall electricity. These run around $30 and work in a lot of situations. They don’t connect to the internet, but you can use it to power your smartphone as a battery backup. If you are hunkered down in your house, I suggest buying several UPS battery backup devices. A good one will run around $100 each, but it will keep a smart TV or computer running for about 2 to 3 hours. 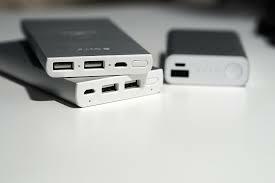 On the other hand, it can recharge your smartphone or tablet about 15 to 30 times. $110. Harbor freight has a 100-watt array that comes with everything you need for around $150. It includes four 25-watt panels, a charger, a couple of DC lights and all the wiring. All you need to add is a big battery. Harbor Freight also offers generators that run-in price anywhere from $110 for a small 700-watt unit to $700 for a 3000-watt Generator that has a built-in inverter for producing clean electricity that works well with electronics. Small wind generators are also available that produce around 400 watts and come in at under $400 as well. One last thing. 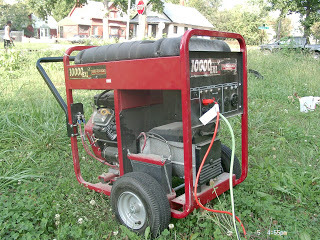 Always follow the direction when using a generator! Social Media to the Rescue - Social media has become the GOTO SOS net for the masses as well. People are reconnecting after storms and other natural disasters via Facebook, Twitter, Instagram and other digital platforms that work on smartphones. People have been able to find lost loved ones, pets, friends and family by going to the Facebook page or Twitter account. A Few Last Tips - Before I provide you with my reference list of useful articles. You must get prepared way before the storm hits. Often, when you go looking for an item locally (like a generator) they are gone as soon as the news mentions a storm is coming. However, with as much as 4 days warning coming in from the National Weather Center, you can order many of the items I mentioned in this article from Amazon or eBay in a couple of days (next day or in 2-days with Amazon Prime). This is another way the internet is making a difference. Conserve power as much as possible. Unplug anything you are not using. Only use one digital device or TV during the event to keep up with the status of the event. Also, be very careful where you go right after the event. Flooded areas are particularly dangerous because of hidden objects, snakes and downed electrical wires. If at all possible, wait a day before wandering around. Give the authorities a chance to assess damage, clear major debris and get the power turned back on. While researching this blog, I came across some very useful articles that would take up too much time to mention individually. However, I have decided to include them as reference articles here and on the notes page. Take your time and read these as well because they are filled with useful information on this subject. When I started to research this article, little did I know i would have to put all of my suggestion into action. By the time I published this article, Jacksonville was recovering from hurricane Irma. After reading this article about how the internet is helping people deal with natural disasters, It is my hope that you share it with friends and family so that they can take advantage of what the internet now provides in the way of better planning and communications. The links in this article will also help you cope with the stress leading up to and through a major disaster like a hurricane, flood, earthquake or solar flare. Please heed the warning when they are issued and above all be safe. This article discusses how the internet has changed how we prepare, deal with and recover before, during and after natural disasters like hurricanes, floods, earthquakes, solar flares and freak storms. This article provides information on how to plan, what equipment will help you stay connected to the internet and how to use the internet to mitigate disasters. 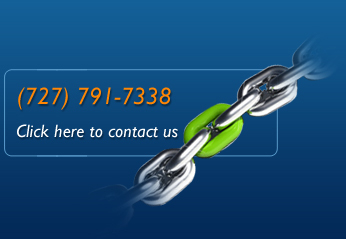 If you feel your business could use some help with its marketing, give us a call at 904-410-2091.